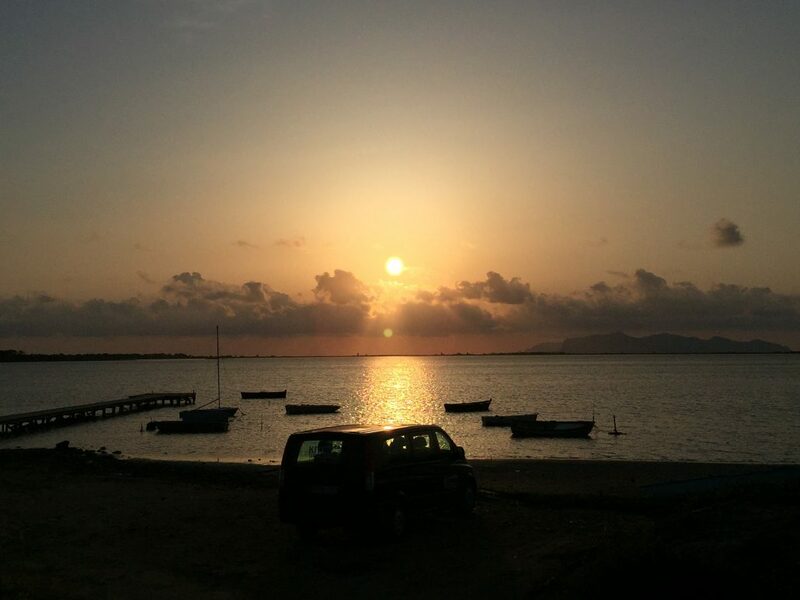 After just an hour flight from Roma Fiumicino, we landed in Cagliari, picked up our rental car and started our drive to the new KiteWorldWide Cottages in Is Solinas. We decided to take the way which seemed to be a bit faster. That road turned out to be a curvy mountain road through amazing landscape and we could enjoy a beautiful sunset, it was not fast, but instead a great welcome to a beautiful island. We reached the accommodation when it was dark already and after a quick check in, Alessandro our guide at the destination took the both of us to a local restaurant, where we had our first amazing Sardinian dinner. I was so hungry and excited that I forgot to take pictures, but you can trust me..it was really amazing! On sunday we woke up with a bit of rain, we were both quite sad that we could not go kitesurfing. 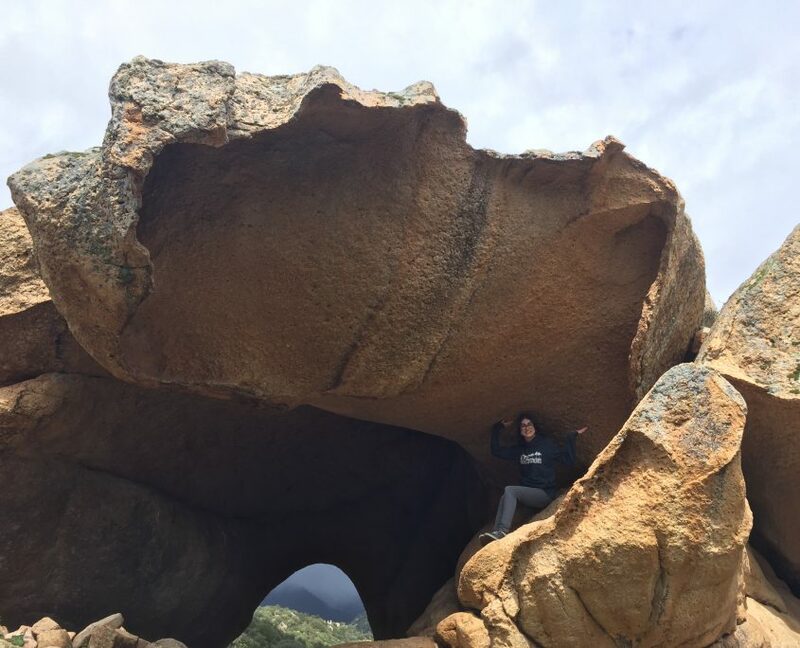 But fortunately Sardinia has so much to offer that we couldn’t sit on our hands. 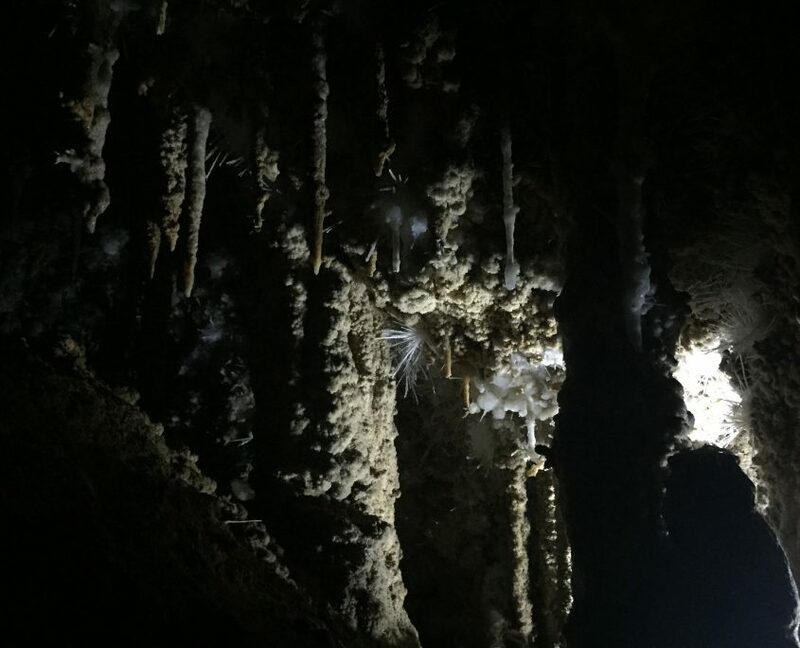 First, we went to the “Is Zuddas Cave”, which is probably the most ancient cave of europe in which time seems to have stopped. I have never seen something like that. Then we just followed our instinct and decided to check out the “Tombs of Giants”. After an uphill path of 1.5 km, we were really impressed: the nature, this awesome landscape from the mountain, and the big rocks. After our excursion the sun was shining, the wind started blowing and the first guest arrived! So we ran to the spot for our first kite session in the new destination, as I mentioned before, with the empty spot only for the four of us. Also the next day was windy and we spent our afternoon at the spot, not alone this time but only with a couple of other kiters or three. That’s why we love the pre and after season: empty spot, a lot of space for everyone, but still great conditions! For our last dinner, we went all together to an agriturismo in the nearby and enjoyed a nice Sardinian food tasting with regional and home-grown ingredients. We really had a lot of food, too much even for me that I love eating, especially good food! Then we went resting again, in order to be ready for the next early morning flight: Sicily was waiting for us! After we landed in Trapani airport, it only took 10 minutes to reach the accommodation, including a quick stop at “Saro” for a coffee and a special sicilian cannolo! 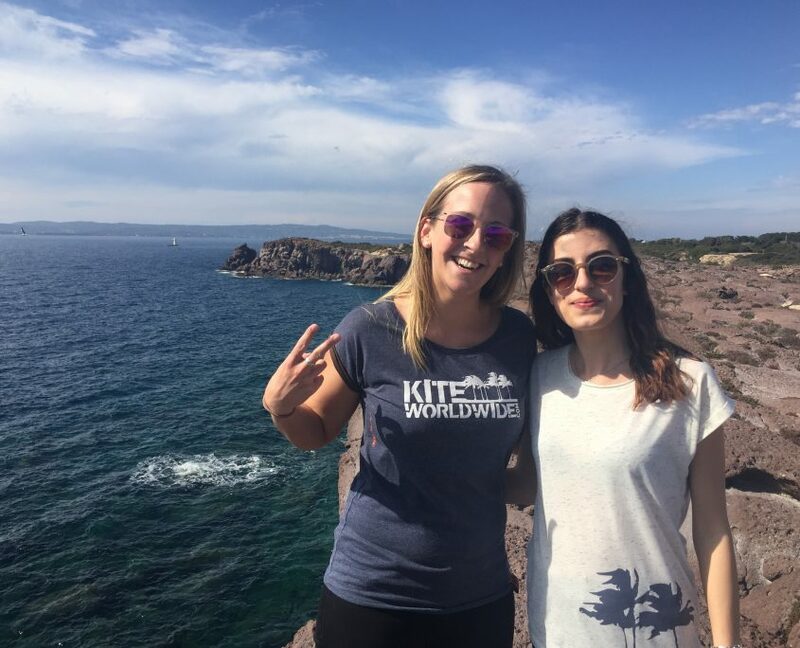 Both Santa Maria Residence and Hotel, which are located directly on the spot, were of course fully booked, but we had the chance to stay in our lovely KiteWorldWide Villa, located in the Baia dei Fenici, still on the lagoon but 1 km away from the kite spot. After 15 minutes walking at the lagoon we reached the kite center and we got ready for another kite session! Sun was shining, wind was blowing..we could not ask more :) In the huge lagoon I could improve my water starts and my riding without worrying about anything: water is flat and not deep, enough space for everyone and even if the lagoon is really big you don’t risk to drift away or getting lost who knows where. 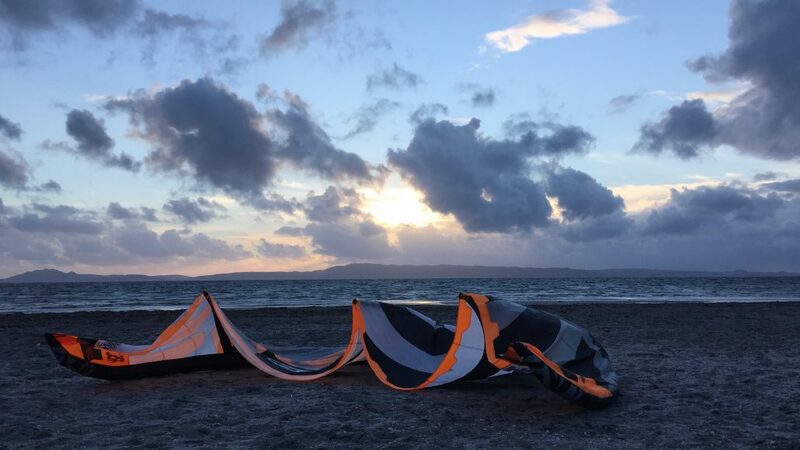 The wind dropped just in time to enjoy a nice after session aperitif at sunset time. It was really a nice welcome! And after that of course, it comes to food again. We had dinner all together at Incanto, the great restaurant below the kite center. I think there’s no need to explain how good the food was, once again! In the next days we also had to work but I still found some time to explore Sicily as well. 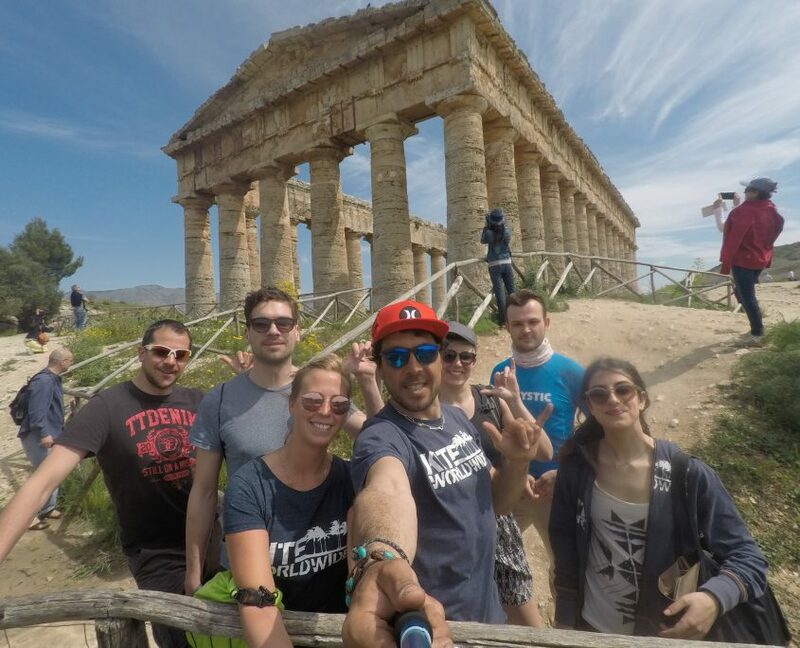 With the staff and the group we went to see the remains of Segesta, an ancient city from 408 B.C., located only half an hour from our spot. 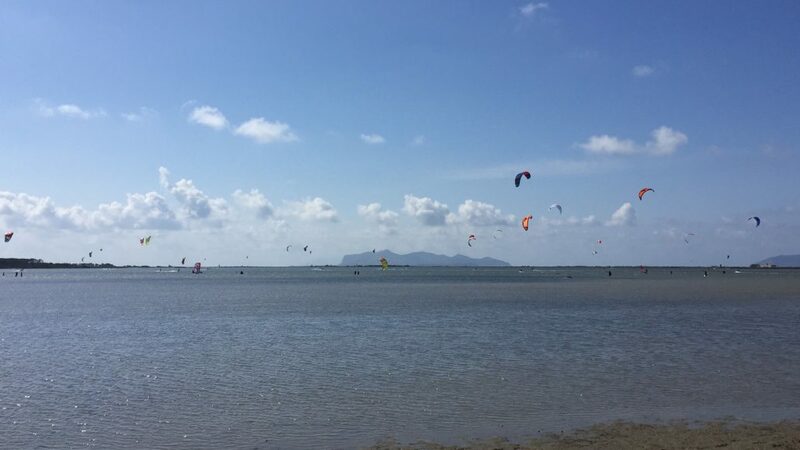 Of course our main focus is kitesurfing when we go on holiday, but a visit is really worth, so in the end I was almost happy that we didn’t had wind that day. After the tour we went eating in Alcamo for lunch, another nice city in the nearby, and then straight to the therms for some pure relaxation! After a short drive and a path between a river and some rocks, here we are in a really nice natural pool with water at 43 degrees! It’s a bit sad that I’m writing this from my home, 4 days each are definitely not enough to discover these two destinations that we’re so lucky to have so close. I know that I just came back, but I’m already looking forward to go back there!